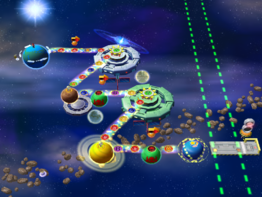 Astro Avenue is a board in Solo Mode from Mario Party 6. It takes place in space, complete with UFOs, planets, an asteroid belt, a path made of flowing stars, and space-themed music. The character starts out on a planet that resembles Earth. The ? Spaces are on small space stations. Landing on one causes a UFO to appear and take the player to another space closer to the end of the board. If a player goes past the last space of the board, they stop at the platform with a stop light next to it. The light then changes from red to green and a spaceship appears, drives into the player, and carries them off to space, resulting in the player losing everything. This page was last edited on June 28, 2018, at 21:47.